We want to continuously improve the services we provide to patients, their families and carers. To do this we need to look at what's currently working well and what could be done differently, and we are using a method called Quality Improvement, or QI, to help us. QI is about problem solving, continual learning and adaptation. The starting point is to identify a problem or a place where we would like to see improvement, and this becomes a QI project. Anyone with an interest in tackling the project - staff, patients, carers or family members - then form a team to look at the issue and develop a plan, which everyone can play a part in and own, to help bring about the changes we want to see. We need to be able to measure the affect that our changes are having so that we can see whether they are making a difference to patient care. If we're not seeing the results we want or expect, we can adapt what we're doing to try and get the desired outcome. Using the QI method allows us to do this and helps us take a consistent approach to problem solving. It supports the experts - the people closest to the problem - to find a solution and test it out. But we don't want to just look at our results, we want to learn from them and grow. QI is about continuous improvement, and sharing our successes, and failures, with colleagues around the Trust so that we can change the way we work and provide outstanding care and treatment that you can be confident in. Our aim is to provide outstanding care and treatment that you can be confident in. We want to do this in partnership with the people who use our services. As an organisation we are committed to continuous improvement and learning. We know that we need to be innovative in our thinking and find new ways of doing things. 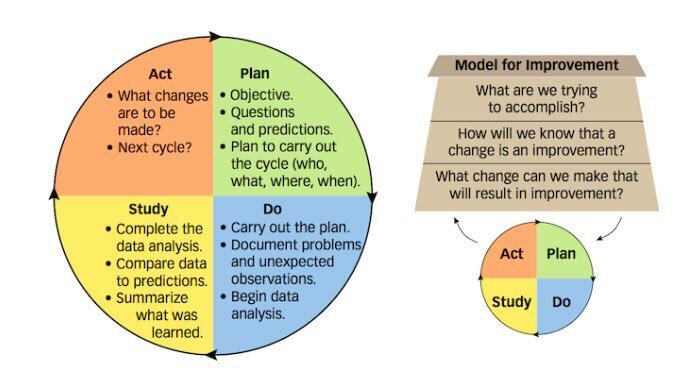 Deming's theory of profound knowledge - a management theory that provides a framework of thought and action for any leader wishing to transform and create a thriving organisation, with the aim for everybody to win. The five whys to root cause analysis - asking questions to identify the root cause of a problem and, where there are multiple causes, looking at the relationship between them. Run charts - line graphs that allow us to see the performance of one or more processes over time to detect trends, shifts or cycles. They are useful for comparing before and after to see what affect a change has had. Process mapping - a diagram that shows how a process works in practice, and how other processes work alongside or feed into it. I've got an idea, how do I get involved? QI is for everybody, regardless of your role, academic background or experience. If you've got an idea for a project we will support you to make it happen. The first step is to complete your Bronze training, which is available online here and will provide you with the basic skills you need to take part in QI project work. Silver and Gold training is available to those wishing to lead projects and coach others in the use of QI. We also have a team of QI specialists who can offer support and advice to help you get the most out of your project. We'll be launching a new website dedicated to QI and sharing the changes happening across Sussex Partnership very soon. Full details will be available here as soon as the site is available.